Starter or adder - shelf capacities to 750 lbs. 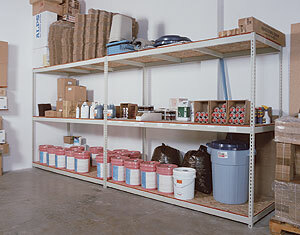 Standard duty units are durable, dependable shelving designed to handle loads ranging from 500 to 750 pounds per shelf. Listed capacities are for uniformly distributed loads on one shelf. Capacities are for steel components, and do not reflect the capacity of decking material. Rivet shelving assembles easily, quickly, and nearly tool-free. Shelves adjust on 1.5" increments, making it easy to configure shelving exactly the way you want it.